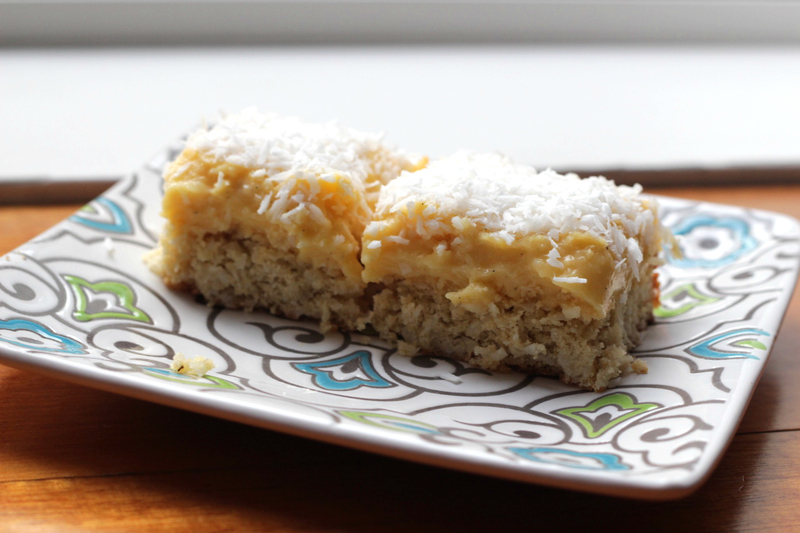 It’s a big claim to say this is the best ever lemon slice. But it honestly is. When I want to eat a dish that I loved in my pre-Paleo days I more often than not find a substitute for it. The Paleo version almost always tastes different and I am ok with that. My palette has changed and the ingredients are not the same. But this Lemon Slice is EXACTLY the same as I remember it tasting before I moved to a paleo diet. The same, people, the very same. There is a cafe in Auckland that serves Lemon Meringue pie which I loved. Apart from the meringue, which I never liked anyway, this is the same tart, lemony, coconut goodness taste as I remember. SO good. I made this for the first time yesterday and every person in the house loved it. There are a fair few fails in my search for good recipes and it’s unusual that everybody in the family loves the first attempt at a dish. This was universally loved. Now I have to say that this recipe is a treat. There is more sweetener in it that I normally like to put in a Paleo recipe but it needs the extra sweetness to counteract the tartness of the lemon. Also this recipe does not meet my super easy recipe criteria but again, WORTH IT. I reckon I could take this little beauty along to an event, slide it alongside all the other sugary desserts and people would pick it and come back for seconds. Preheat oven to 180°C (350°F). Line a 20x20cm baking dish with cooking paper, allowing the paper to go up the edges of the dish. In the bowl of a food processor, combine the eggs, coconut oil and honey and process until smooth. Add the coconut flour and 1/4 cup of the shredded coconut, cinnamon oil, baking soda and salt and process again until combined. Remove the blade from the bowl and stir in the remaining shredded coconut. Press the crust evenly into the prepared baking dish and bake for 15minutes or until the edges are starting to turn golden. Allow the crust to cool. In a medium saucepan over a medium heat, whisk together the lemon juice, lemon zest, eggs, honey, maple syrup and sea salt. Slowly add the melted (cool) coconut oil while whisking constantly. Whisk until the mixture starts to thicken- it should be thick enough to coat the back of a wooden spoon. Watch the mixture- don't leave it unattended. Strain the filling through a fine mesh strainer to remove any cooked egg bits. Stir in the vanilla extract. 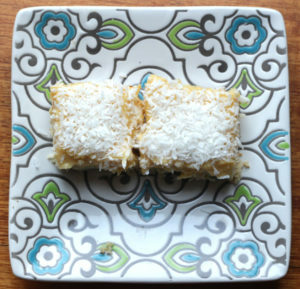 Pour the filling over the cooled baked crust and sprinkle the top with shredded coconut. Cover and refrigerate for at least 4 hours, or best overnight, to allow the curd the set. Remove the slice from the baking dish by lifting up the cooking paper and cut into 16 prices. Will keep in the fridge for up to 4 days. This slice is on the fragile side due to the light & fluffy curd. Using a spoon to eat it is the way to go!